LPGA Professional Stacie Lewis. Image source: golfforher.com. The Golf For Her magazine has started a new series called “Setting Up Golf Courses For Success.” You can follow the series here. 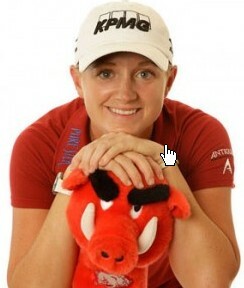 LPGA Pro Stacie Lewis, pictured here, wrote the Foreword for the article. She is an advocate for making the game fun for everyone – for the excellent golfers and for the new golfers. Stacie’s goal is to grow the game by making it more fun for the new woman golfer. Sierra View Country Club, not to be left behind, has been working with a golf course architect and an internal committee of members to evaluate, hole by hole, where changes could be made to make the course more attractive to mid-to-high handicap players, without diminishing the challenge for low handicap players. Hole 3 – Take out the fairway bunker on the right. All it does is penalize the high handicap player. Hole 5 – Take out the pot bunker in the middle. It makes no sense and again, is an impediment to the high handicap player. Low handicappers don’t even know it’s there! Hole 12 – Add a forward tee approximately 115 yards from the green. Sweet! Hole 17 – Rework the green-side bunker to be more forgiving and playable. Those are just a few of the recommendations. Over time, as the committee evaluates each recommendation and puts a price on the cost of the change, we’ll start seeing things happening on the fairways. New tee boxes, for example, are costly. Equipment has to be brought in for providing proper fill for drainage and for laser leveling. Sod is costly, about $2.50 a square foot. And it can be disruptive, taking two to three weeks to complete. But the cheers you will hear from the short hitters when the #12 tee box is complete will resound all over the course.